That’s what PremierX Pest techs hear often when it comes to bed bugs. Don’t worry our techs are here to help you. The EPA, CDC and the USDA consider bed begs a public health pest. The good news is this type of pest is not known to transmit or spread disease. However, they can cause other health issues to include secondary infections of the skin to anxiety and insomnia due to lack of sleep. Landlords/ apartment managers/ business owners should know that bed bugs do not only live in a bedroom or on a bed. Bed bugs are small, oval insects that can be difficult to see because of their size, color and they often hide during the day. Bed bugs feed by sucking blood from people and *pets. Bed bugs can live anywhere in the home/business to include; the bed, upholstered furniture, cracks in furniture, cracks in walls. They are most commonly found in/on mattress, box springs, bed frames and bedding. PremierX Pest Control has a skilled team to battle any bed bug problem. 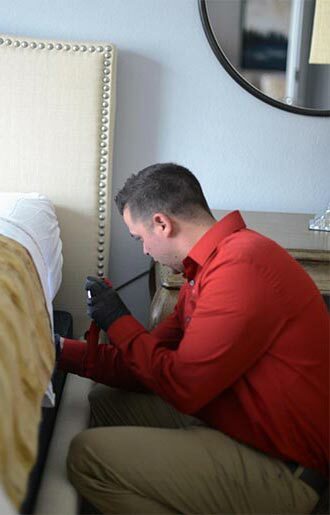 Our technician will complete a thorough inspection of your home/ apartment complex/ business to see if the hard to spot bed bug is what’s keeping you up at night. Our treatment includes more than spraying product and hoping it works. PremierX Pest technicians will determine the severity of the infestation and come up with a plan to get rid of the bug. The first round of treatment includes extensive labor by our techs to get rid of as many bed bugs and their larvae before product is applied. If it’s deemed the product is needed, our tech will assess where to place the product to get the best results. Plan on seeing PremierX Pest techs for the next 60 days. We will do follow up inspections to make sure the pest is gone. If it’s not, technicians will conduct follow-up treatments for up to 60 days. CALL 505-269-5760 AND REQUEST AN APPOINTMENT FOR FREE QUOTE NOW! Why Choose Us? Simply because we are the best pest people in town!